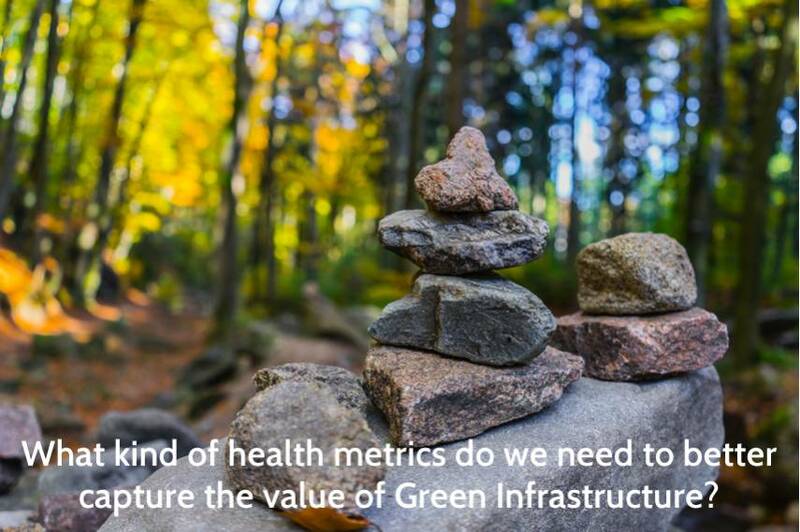 What Health Metrics do we need to better value Green Spaces? What current health metrics do you use (if any) to inform decision making for better uptake of Green Infrastructure (GI)? 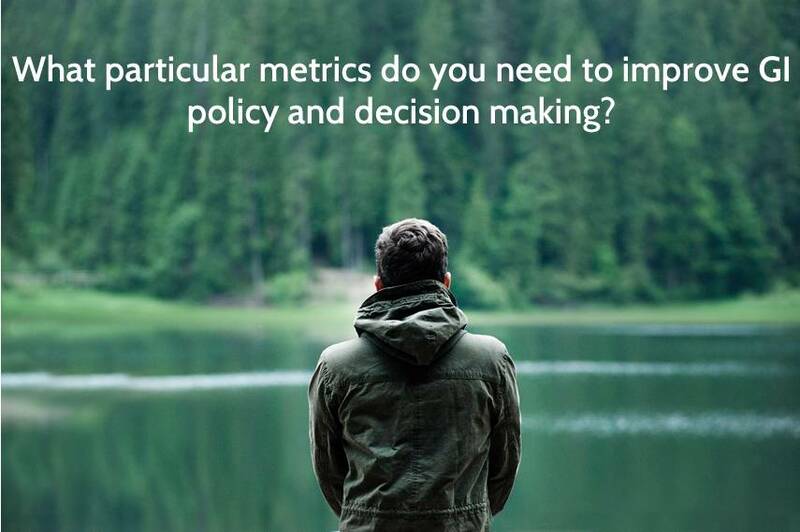 What particular metrics do you need to help your policy and decision making? 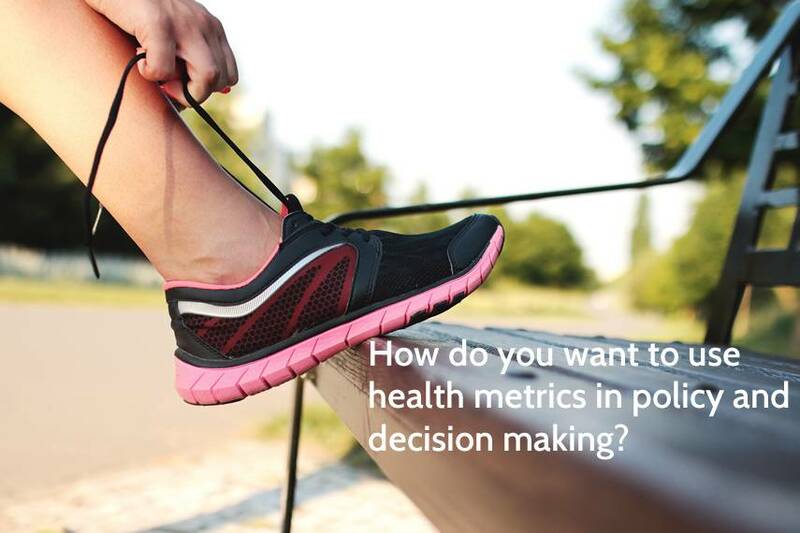 How should we use health metrics in policy and decision making? 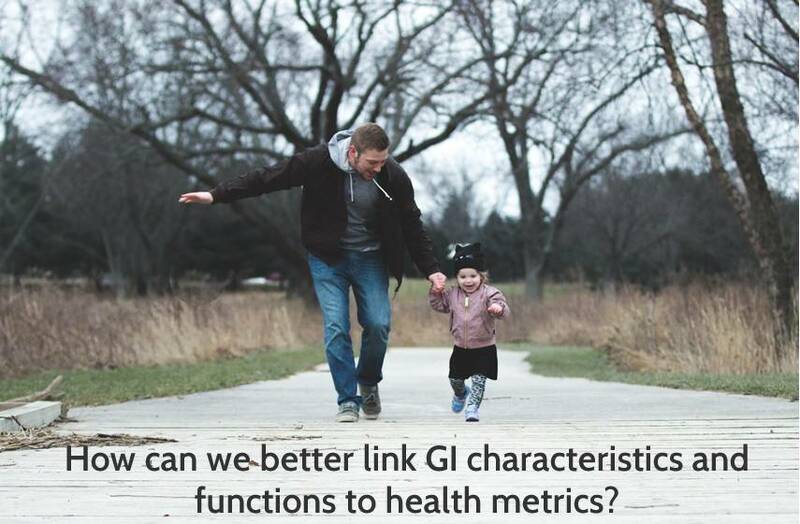 How can we better link GI characteristics and functions to health metrics? Summaries of the participants' answers to these questions can be found below. Participants explained that they tend to use established data sources (e.g. census data, index of multiple deprivation), combined with agreed standards (e.g. Angst, Green Flag). Other surveys are also used as secondary data sources (e.g. Active lives survey, MENIE obsesity survey). There was, however, a bias towards more bespoke metrics with site surveys featuring in terms of visitor numbers, usage and activities. Interestingly, there was also use of perception data including user self-assessment. Other answers clearly show the use of bespoke metrics on the way nature impacts upon peoples experience. It is unclear what these metrics are and how they are measured given the relatively few words used to describe them but this does warrant further investigation as all too often we reinvent wheels without spending time looking at what exists and has been used. One interesting point is that the use of acronyms by respondents may get lost in translation at the health planning interface. The answers are diverse, reflecting a diverse user group with varying needs. The answers and individual discussions I had also stressed the need to develop a bundle of metrics that collectively address the topic, rather than rely on one or two metrics which may given a misleading view. There was a clear need for more economic-based metrics capturing the value of GI both in terms of the ecosystem services provided and consequential multiple/cobenefits, but also in terms of usage of specific spaces. Interestingly, as well as parks and sites, linear GI (e.g. public rights of way) are identified as resources. There is also the need to input current health metrics into GI assessments rather than create new ones. The link between trying to assess the NHS costs forgone by GI interventions also appear with stronger metrics to social prescribing. There was also recognition of the value of nature as spaces for innovation and inspiration as reflected by agencies using such locations for away days but this can be scalable down to the individual level for a lunch break too. I can't remember the last time I went for a walk in green spaces to think through a problem at work. The issue of metrics assessing quality became important in several answers in terms of the quality and desirability of green spaces with metrics also associated with its productivity and as a space for innovation. There was a clear concern that metrics are being used on quantity alone as they are easier to measure. 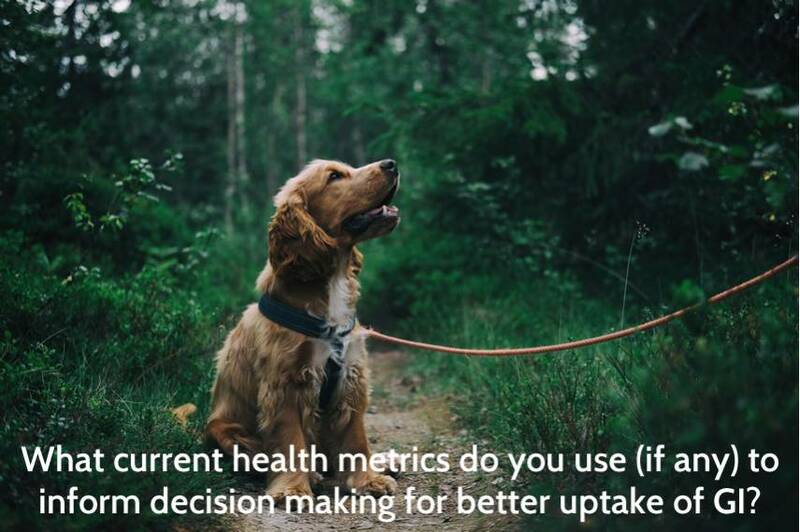 The most commonly encountered response was for metrics to be decision-support tools to inform decision-makers with extreme care needed over their design, use and interpretation. There was consistent support for them to be used to improve planning guidance (National Planning Policy Framework/Planning Policy Wales/Scottish Planning Policy), policy (local plans) and outcomes; planning decisions and housing developments in particular with reference also made to building regulations. They were also seen as important for investment and securing more funding priorities. There was concern that metrics also need to feed into existing decision systems such as appraisal (monetary valuation) and health investment. It was important to work with existing decision systems in design of metrics. Key issues were also raised around the need to measure marginal change that targets those in most need as opposed to those who were already benefitting; a real danger with GI investment. How do you measure that? And to factor in both investment in new spaces as well as retrofitting GI in areas without sufficient access. Again, the issue of identifying the costs foregone by provision and use of GI was seen as important to capture. One really interesting issue was raised about the need for improved training of decision makers (also extending to developers) so that they fully understand the value(s) and benefits of greenspace and thus can become future champions. A comment made verbally was that events like this conference attract those who have already bought into the concept. How do you get the sceptics into the room. This question attracted a great variety of responses/ideas and this crude summary narrative can’t do justice to all the ideas voiced. Thus, it is important to read them as they were written (see the link to the full report below). It was recognised that other audiences needed to get the message and there was a danger of preaching to a converted audience so other more subtle 'trojan horse' approaches are needed. Training and CPD on the value of green spaces in green spaces was also suggested. The issue of linking metrics within approved standards schemes such as BRREAM was seen as one way to promote change. It was important here not always to develop new metrics or associated tools but to consolidate and improve the existing ones. We often see more developed which merely confuses and becomes part of a fallacy of creeping data incrementalism without knowing the problems you want solved. The same philosophy was recommended for tools and it was stressed that new tools were not wanted. However, the idea of developing standards for walking and cycling activity akin to the World Health Organisation heat standard was interesting. More economic metrics were also identified where GI investment had occurred so as to demonstrate its value. It was here that demonstration sites with longitudinal data and sensors were suggested as a way for people to see on the ground what good looks like with access to all evidence. Here, points about physical activity rates and ecosystem services benefits commonly featured. Evidence featured but not in the usual way: rather than more, it was about translating the evidence in more accessible formats to better influence decision makers. There was also support for using both quantitative and qualitative data where people's experiences and stories equally mattered. Associated with this there were points about identifying the best hooks to engage diverse audiences. Wellness was seen as one. Finally, there were some interesting points made about understanding and building upon people's connections with nature and to find out what sparks improve such connections. Gardens were one area to engage. The draft report is available to view/download as a PDF. In this report, you can read all of the responses that participants contirbuted on post-it notes during the workshop exercise.